Ok so today’s picture is a bit of a cheat for both 100 Birds in 100 Days and the working on children’s books monthly challenge but the picture contains birds (they are seagulls incase you were wondering) and I now plan to write a children’s story around the picture. 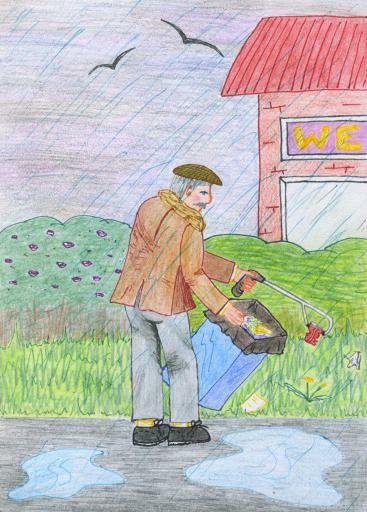 I drew it yesterday after seeing an old man picking litter by himself on the outskirts of Gloucester – I couldn’t get a photo and it was beginning to rain heavily so I sketched him when I got home, inked it in and coloured it with coloured pencils. I put it out yesterday on my personal blog and stuff yesterday and have since been sent this cool link about local litter picking heros! I just found it inspirational and heart breaking – heart breaking that the litter is there but amazing that he was doing his bit for his local environment! Categories: 100 Birds In 100 Days, Artwork, NaPiBoWriWee.